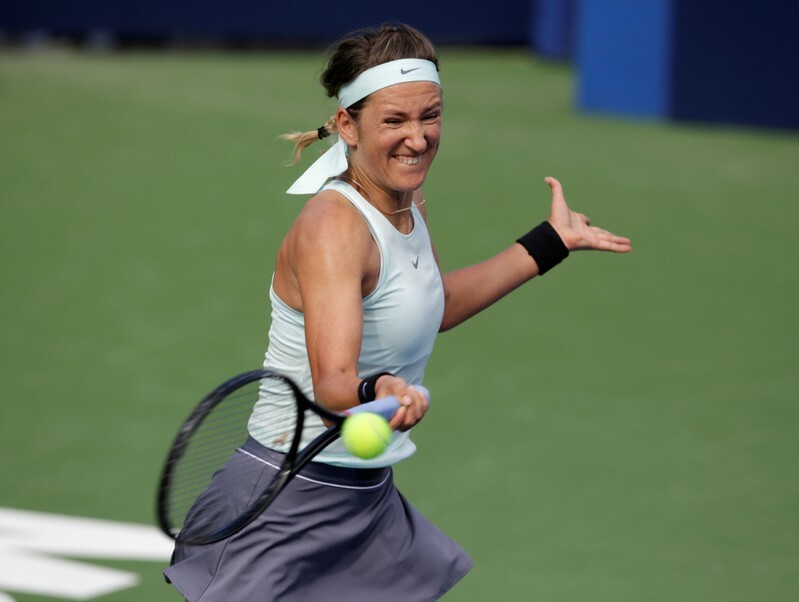 (Reuters) – Belarusian Victoria Azarenka made a winning return to Stuttgart with a 7-5 6-4 victory over Russia’s Vera Zvonareva in what was an engrossing battle in the first round of the Porsche Tennis Grand Prix on Wednesday. Azarenka, a former world number one, was pushed in the opening set, especially by Zvonareva’s first serve, but fought back to break her four times in the match. The last time the pair met was in 2011 when they were both ranked in the top 10. “We’re both in completely different stages of our careers, we’re both moms,” Azarenka said after her win in a match that lasted an hour and 45 minutes. The 29-year-old, a two-times Australian Open champion, also had to overcome jet lag after competing in the Fed Cup semi-final in Australia at the weekend. Azarenka will take on fourth seed and defending champion Karolina Pliskova next for a spot in the quarter-finals. Earlier, Switzerland’s Belinda Bencic started the tournament strongly with a 6-2 6-4 victory over qualifier Mandy Minella, in a match that lasted 75 minutes. Bencic, who ended a four-year title drought in February when she beat world number three Petra Kvitova in Dubai, struck 24 winners with her aggressive returns dominating the Luxembourger. The result pits Bencic against sixth seed Kiki Bertens. Last year’s semi-finalist Anett Kontaveit of Estonia breezed past France’s Caroline Garcia with a 6-4 6-3 win while Donna Vekic beat Giulia Gatto-Monticone 6-1 7-5 to advance. 2011 champion Julia Goerges’ first match was cut short by injury with the German forced to retire when she was trailing 4-0 in the final set to Anastasia Pavlyuchenkova. Goerges had taken the first set 6-4 before the Russian took the second 6-2. Roster reveal day is always one of the best days of the month! So what will May hold for me? Where will the skies take me? Time for a little celebration! !